The updated antique colonial house at 25 Fanton Hill Road has nine rooms and 3,674 square feet of living space. WESTON — In the days before Weston existed as a separate municipality, when the lands of Weston and Easton were jointly known as Norfield Parish, the entire region was dedicated to agriculture. Although the town’s water power brought industry beginning in the 18th century agriculture continued and the vestiges of it remain in the landscape today. In some cases, as with the large barn and cattle shed of the Coley homestead on the Weston Historical Society property the structures are vintage and have been preserved. The barn was built circa 1880 and it is listed on the Historic Barns of Connecticut website, a project of the Connecticut Trust for Historic Preservation, along with three other barns in town. In the case of the property at 25 Fanton Hill Road the colonial house originated in the early 19th century while the barn is not vintage. The house was built in 1818 and remodeled in more recent years to keep up with today’s lifestyle. But the post and beam barn is a modern day structure made to look like it belongs in the past. Past, present or future, the next owners of this country retreat will find excuses to hang out in this custom-milled barn. It was recently built by Vermont craftsmen and assembled in Connecticut. The front portion of it houses the two-car garage but the back contains a cavernous two-story family room with a cathedral ceiling, an impressive floor-to-ceiling stone fireplace and hand-hewn beam mantel, exposed trestle beams, a large loft and a walk-out lower level. The barn is a great place for entertaining. The 3,674-square-foot house is equally great for entertaining, and lost none of its charm in the updating. 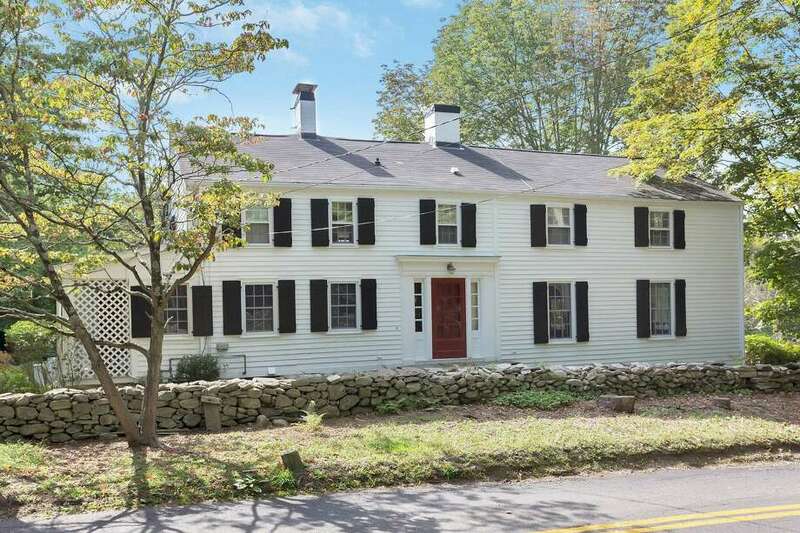 The white clapboard house with black shutters sits behind a fieldstone wall on a 2.09-acre level and sloping property. Its front door is flanked by sidelights. More often than not people enter the house from the rear, the path and stairs to which are accessed from the long driveway, which is lined with a row of individual fieldstones. Inside, the entrance foyer at the front of the house is spacious enough to accommodate furniture to create a sitting area. To the left is a library with a fireplace and a wall of built-in bookshelves. This part of the house also contains a guest suite. This bedroom has a door to a covered side porch and its bath has an old-fashioned claw-foot tub. To the right of the foyer step down into the spacious formal living room, where there is a fireplace, built-in cabinetry with glass doors, walk-in area, and French doors to a large slate deck with a retractable awning. The deck can also be accessed from two separate doors in the formal dining room and from the chef’s eat-in kitchen. From the foyer there is a pass-through area into the kitchen with pantry cabinets and a built-in desk area that could serve as a home command center or even a homework station. The updated kitchen features a long center island topped in granite, perimeter countertops in the same stone, tumbled marble backsplash, and high-end appliances including a Viking Professional six-burner range with a griddle and refrigerator. The island serves as a breakfast bar for three. There is also a sizable eat-in area for casual dining. The mudroom off the kitchen has a Dutch door into the laundry room. There are three bedrooms on the second floor. The spacious master suite has a dressing room and its bath features Carrera marble on the floors, backsplash and double vanity. The other bedrooms share a hall bath. While its location feels remote, this house is only five minutes from the Merritt Parkway and one hour from New York City. Residents of Weston have access to the town’s award-winning public school district and beach rights in neighboring Westport. For more information or to make an appointment to see the house contact Paula Kroll of Halstead Property at 203-253-2248 or pkroll@halstead.com.